Your daughter doesn’t come home one night from her summer job. You go there looking for her. No one’s seen here. But it’s worse than that. No one’s ever seen her. So where has she been going every day? And where is she now? 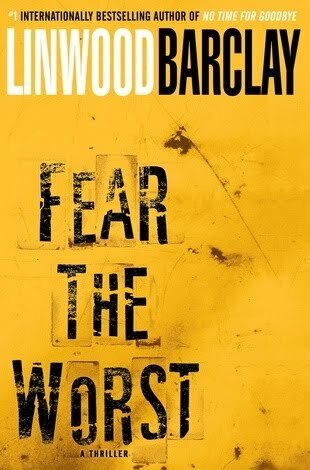 In Linwood Barclay’s riveting new thriller, an ordinary man’s desperate search for his daughter leads him into a dark world of corruption, exploitation, and murder. Tim Blake is about to learn that the people you think you know best are the ones harboring the biggest secrets. This is truly a roller coaster ride!! Super fast pace—a real page turner. Once in awhile I like to read a good thriller. I saw this one on Shelf Awareness and it immediately caught my eye. I really enjoyed the main character, Tim. He’s not a perfect dad (who is?) but he clearly loves his daughter Sydney even though they don’t always get along. When she goes missing, his frustration and concern rang true for me. The pace of this novel is unreal! Every chapter ends with a startling discovery. Okay, not every discovery was completely unexpected but what I really liked is that even though the chapter ends with a discovery, it’s immediately picked up again at the beginning of the next chapter. It’s told from Tim’s point of view so we are never left hanging for long. I found the ending to be very abrupt. Like slamming on your brakes. It came out of nowhere and simply ended. Perhaps the frenetic pace of the rest of the novel made the ending seem abrupt, but I could have used a few more pages to ease into it a bit. Overall, this is the perfect book for summer. It’s quick and entertaining and although I have never read any of Barclay’s other books (and he has several), I would definitely pick up another one. This book was sent to me by Random House via Shelf Awareness and officially comes out on August 11, 2009. If you’d like to learn more about Linwood Barclay’s other books, check out his website. Ti…thanks for the review. I really like this author, and need to add this to my list! That sounds like a great book.. almost like the movie, "Taken". Bummed that the ending is so abrupt! I loved his last book, No Time for Goodbye and it sounds as though this will be just as good. I'll try to get a copy from the library. I didn't realize this one was so fun. I'll have to look for it now! It's nice to get on a roller coaster of a book every now and then, isn't it?! Diane & Farmlanebooks – I must read one of his other books. I liked the quick pace of this one. Allison – I've not seen Taken but I know the premise. Anytime a missing child is involved, even though this one is a bit older, you can't help but bite your nails off waiting to see how it all turns out. Jill – It was a fun read, given the grim subject matter. Zoom, zoom, zoom. Lit & Life – I needed that roller coaster ride! I felt like I was in reading rut. I am so in the mood for a page turner. I am actually working on one right now, The Kitchen God's Wife by Amy Tan, way good. It isn't a thriller, but it is fab. I have noticed a lot of times that intense books seem to not transition well to an ending, sorry that was the case with this one too. Yaaaaaay, I'm glad to see you liked it. I'm just starting it now. I'm a Barclay fan-I've been reading his the past few years and liked them all. I just skipped to the end to see if you liked it as it's next on my list. I love Barclay! Glad you did too! Ooooo good review. This one sounds great.. however.. being the wuss that I am ( I think most are beginning to know that about me).. I will pass. I love a good thriller too, so I'm going to have to look for this one! I really enjoyed his No Time for Goodbye, and it looks as though I need to add this one to my wish list. Thanks for the review! I've heard good things about Barclay's books but have never read any of them. Thanks for this review! I like a good thriller too every once in a while — this seems like a good one … kind of reminds me of a Harlan Coben book.